The concealed carry pistol market has been growing rapidly over the last few years, and there are a ton of great options out there to choose from. Unfortunately, these options become very limited when you only have a budget of $300. 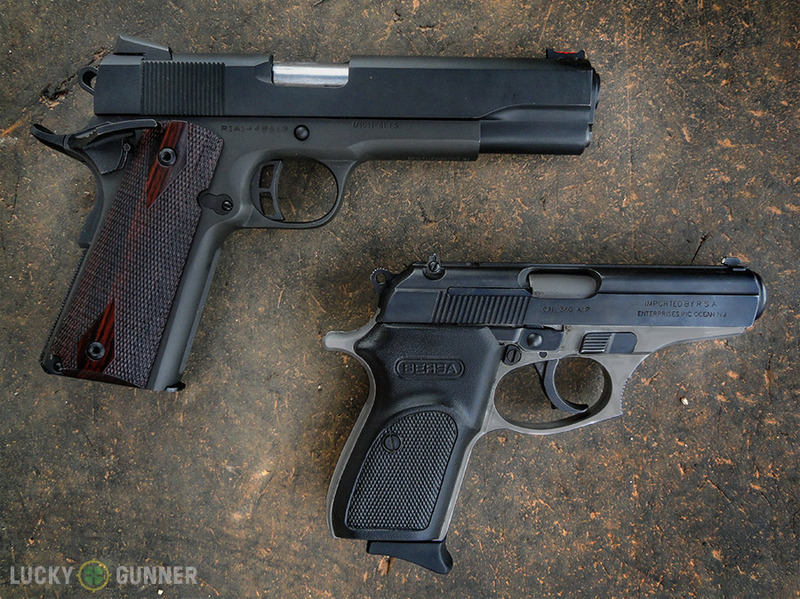 Today we’re going to take a look at the Bersa Thunder .380 and its little brother, the Thunder .22. The Bersa Thunder is hardly new to the compact pistol market, but it remains one of the best values out there today and is my personal choice for a daily carry pistol. 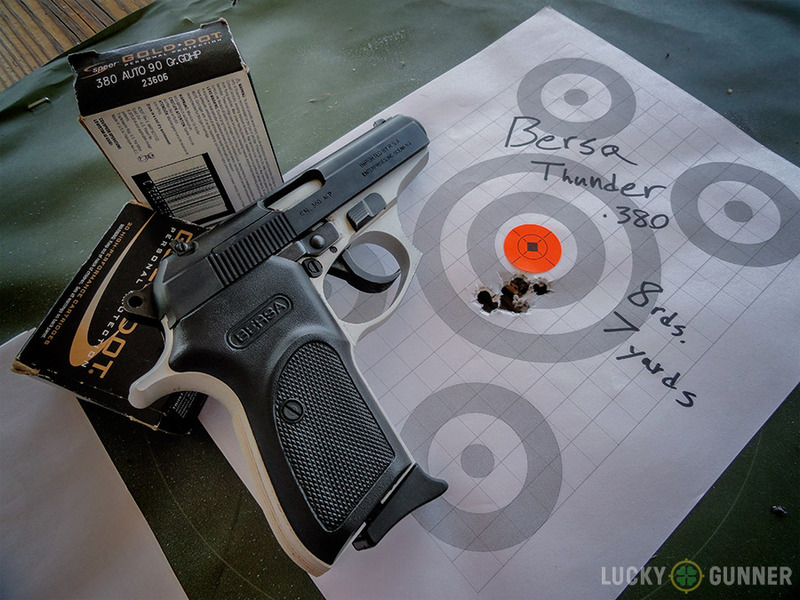 The Bersa Thunder is a simple blowback operated handgun chambered in .380 ACP, .32 ACP, or .22 LR. It is produced in Argentina and borrows heavily from the earlier Walther PPK in terms of function and styling. It is a popular recommendation for those wanting a concealed carry pistol due to its combination of pleasant aesthetics, build quality, and $300 price tag. Each Bersa Thunder holds a lifetime warranty valid for the original purchaser as well. The Thunder .380 features a 3.5” barrel, 7+1 round capacity in .380ACP, slide-mounted safety/decocker, and an alloy frame not usually seen on pistols in this price range. The .22LR version is the same, but holds 10+1 rounds of ammunition. The Thunder ships rather humbly inside of a cardboard box and comes with just one magazine, which only makes sense in order to cut the overall consumer cost while still delivering the necessities. Also included is a set of keys for the internal trigger lock. The thing that most impresses me about the Bersa Thunder is just how much you get for your money in terms of features built into the gun. The trigger guard is shaped and serrated for those who like to use it as a gripping surface, and the top of the slide is thoughtfully checkered to cut glare. The Bersa’s magazine release button is also checkered and is easy to reach without being obtrusive. 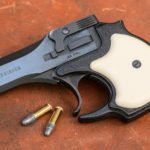 It also includes all the modern safety features that we’ve come to expect such as a hammer block and trigger disconnect when the safety is engaged, as well as a firing pin safety that prevents the gun from firing if dropped. 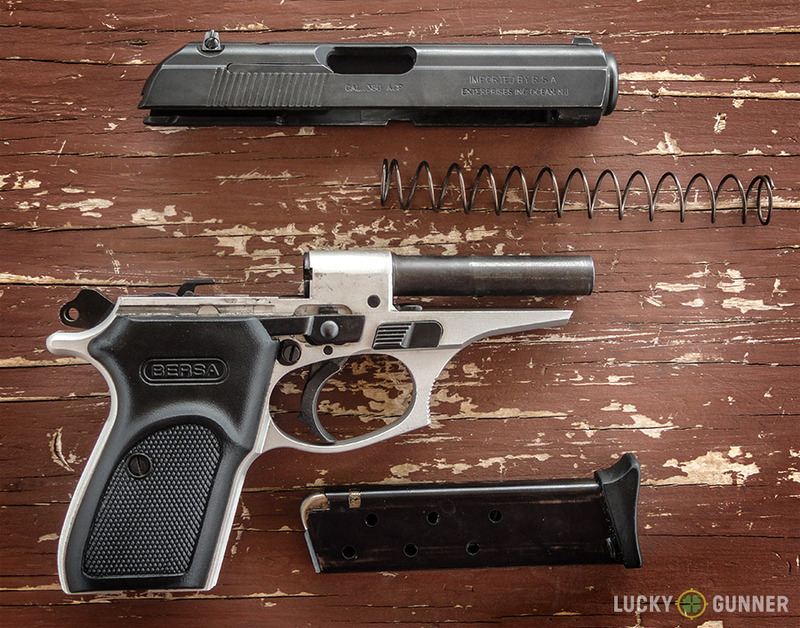 Unlike the much more expensive Walther PPK, the Bersa Thunder comes equipped with windage adjustable 3-dot sights as well as a slide release lever. The Bersa also improves upon the original Walther design and features a sufficiently large beavertail to mitigate “slide-bite” which was common with the early PPK models. Unfortunately, the engineers at Bersa decided to include even more bang (or lack thereof) for your buck and also supplied the gun with a key activated internal trigger lock as well as a magazine disconnect which prevents the gun from firing if the magazine is not in place. 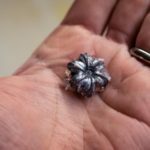 While these items may be attractive for some gun owners, the vast majority of shooters (including myself) see them as unnecessary and potentially dangerous mechanical complications. Despite these unwanted additions however, the Bersa still comes out ahead of most of its $300 competition, at least from a functionality standpoint. Chris and I may not share the same feelings for the Bersa Thunder, but we both agree that shootability is extremely important in a carry gun. The ability to shoot accurately and comfortably with your carry pistol is pretty important if you’re going to become proficient with it, and this is exactly the reason I went with the Bersa Thunder in .380 and then went back for a second helping of Thunder in .22LR. Because of its alloy frame coupled with its not-too-small size, the Bersa is much easier to fire accurately than some of the smaller offerings available. It has sufficient grip space even for large hands, but still conceals easily. 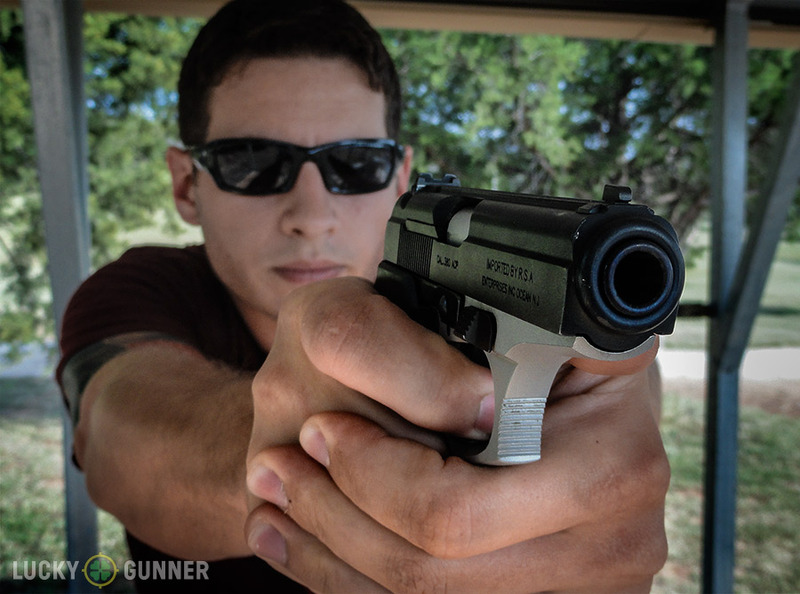 The .380ACP’s recoil is quite “snappy” which is common with blowback guns, but the sights are easy to keep on target thanks largely to the ability to get a full and firm grip on the gun. The .22LR model is pure joy to shoot, and at less than half the weight of my Ruger MkII it’s my go-to gun for teaching new handgun shooters. The Thunder .22 is also a great training tool since it is identical to its .380 counterpart with the exception of being 2 ounces lighter. It also costs less than most .22LR conversion kits available for other pistols. Accuracy with the .380 is quite good, as this 7 yard offhand group illustrates. It’s more than sufficiently accurate for defensive shooting. So it Shoots, But is the Bersa Thunder Reliable? No matter how well a firearm shoots, it isn’t very useful if it does not function properly. Fortunately both of my Bersa Thunders have been very reliable shooters when fed proper ammo. I did have a couple of failures to feed in 100 rounds of S&B 92 grain FMJs with my .380 but the 200 rounds of Magtech ammo I shot through it functioned perfectly. It also runs very well with Speer Gold Dots, which I have chosen as my carry ammo. 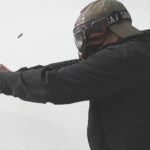 Each gun is going to be just a little bit different, and it’s important that you try a few types of ammo to find out what your particular gun likes regardless of make and model. My Thunder .22 has had several ammo-related malfunctions due to me using cheap bulk ammo, but no more than I experience with my Ruger MkII which is often used as a benchmark when it comes to .22LR handgun reliability. In the end the Bersa Thunder represents an incredible value for a budget gun like this. It’s one of the only all-metal guns you can get at this price point without buying a surplus handgun. While it is not ultra-small, the Bersa finds a good size balance that makes it great for concealed carry and close range target practice. The real drawback of the gun is its .380 ACP chambering, which costs more to shoot on the range and also delivers substantially less energy than 9x19mm, but the great handling and shootability at least partially make up for this by allowing very accurate shooting from the compact gun. Love them or hate them? Let us know what you think in the comments! The Scout Rifle: Is it Still Relevant?